Did you know that National Grandparents Day is the 1st Sunday after Labor Day? Are your kids thinking of fun ways to celebrate? Here are a few fun & creative ideas they can try. 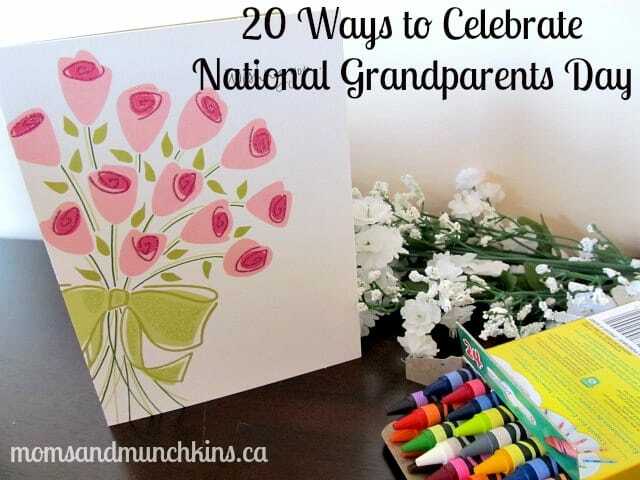 Some are for grandparents that live close by and some are for grandparents that live far away. No matter the distance between you – there are many fun ways to celebrate this fun day! How will you be celebrating National Grandparents Day? Looking for more fun ideas to enjoy as a family? Join our community on Facebook to share fun ideas with us! Thanks you so much. What great ideas! I had no idea that Grandparents Day was approaching. Thanks for the heads up and the great ideas! My parents live in Nova Scotia and my daughter and I are in Ontario. So, giving our distance but desire to spend time together we have planned a family Google+ hangout for Sunday! My Dad loves learning new things to do online, I love Google+ so it’s a win win.